The whole premise behind the pocketcam is that it’s very easy to use. Hand it to anyone on the street, point out the record button and they’ll be making movies. So it’s hard to innovate in this category. Sony has with its Bloggie Touch. The Bloggie Touch isn’t the first touchscreen pocketcam, but they got it right by using a capacitive display—the type that responds to the lightest of touches. That means that the Bloggie Touch has just three buttons: power, record and photo for recording still images. Browsing through movies and images, deleting items and selecting items to share is all done contextually on-screen. Sony has also upgraded the video quality, using its XMOR sensor, which works well in low light, and a fast wide-angle lens. The Bloggie Touch can focus at just four inches from an object, a lot closer that most pocketcams, and has a 4x digital zoom. The Bloggie Touch will record Full HD movies (1080p) and also take 12.8 MP photos. Two models will be available in October. 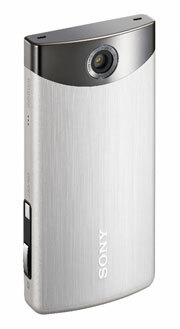 The MHS-TS20 ($199), which has 8GB of memory (4 hours of video storage) and the MHS-TS10 ($179), which has 4GB of memory.